No Hassle, smooth and easy as previous transactions. The Radian Series GS7048E Grid/Hybrid™ (full-flexibility grid-interactive/off-grid) Inverter/Charger is engineered toward one goal: making system design and installation easier and faster in grid-interactive and comprehensive off-grid applications. The Radian Series simplifies the configuration, distribution, and implementation of energy storage through a standardized approach when integrated with an OutBack GS Load Center, making it easier than ever to provide successful solutions for virtually any residential, commercial or institutional power requirement. 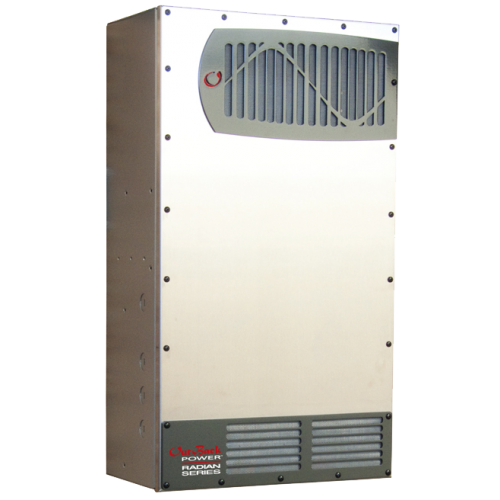 The all-new 230V 50Hz Radian reflects OutBack’s ongoing commitment to clean, reliable power for homes, businesses and other facilities around the world, delivering 7,000 Watts. This model combines pure sine wave power output technology with unsurpassed surge capability to start the most demanding appliances, and are built around a unique dual-power module design which ensures high efficiency in both low and full power operation as well as redundancy in mission-critical applications. The Radian Grid/Hybrid inverter incorporates OutBack’s FLEXgrid™ technology for full operational flexibility. Modular system architecture and simplified parallel design supports three-phase systems up to 21kW and multiple inverter arrays of up to 70kW. System integration and programming are easy with OutBack’s powerful MATE3 Control and HUB Communications Management devices. An advanced, front-vented layout provides optimum cooling in zero-clearance installations (i.e. where units are stacked next to each other). Field-serviceable design simplifies maintenance if needed, and firmware updates can be easily made in the field without specialized equipment.